Two months ago, NPQ asked what reconciliation with its historical ties to slavery might mean for Georgetown University in Washington, D.C. Now we know. 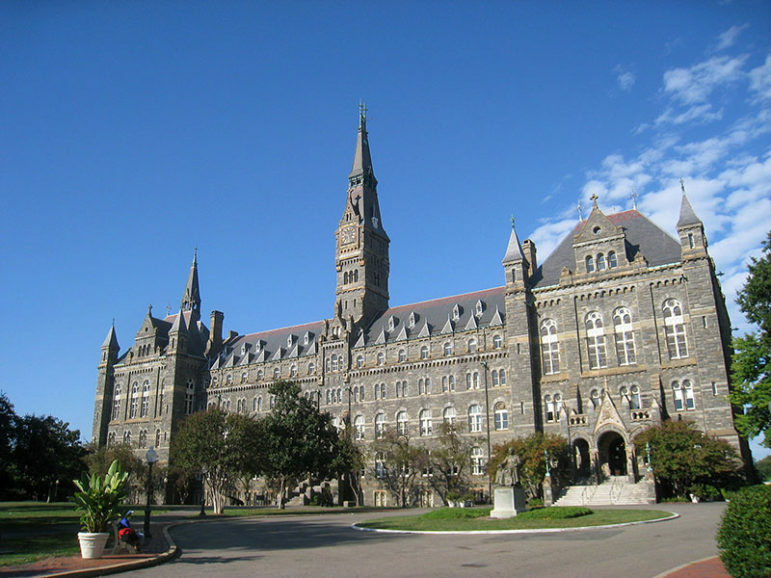 Beginning in the 1780s and until the end of the Civil War, Georgetown University’s origins and growth can be linked directly to America’s slaveholding economy. The Jesuit-owned and operated plantations in Maryland that were run with slave labor were a primary source of funding for the school. Georgetown University’s president, John J. DeGioia, established a 16-member Working Group on Slavery, Memory, and Reconciliation a year ago to make recommendations on how best to come to terms with Georgetown’s historical relationship with the institution of slavery. Here is the report the Working Group produced, and its digital archive of historical documents. Offer a formal apology in the form of a Mass of Reconciliation in partnership with the Jesuit leadership in the United States and the Archdiocese of Washington. Award preferential status in the admissions process to descendants all the slaves whose labor benefited Georgetown (not just those 272 slaves who were sold). Create an institute for the study of slavery. Rename two buildings on campus that are presently named after the two priests who made the sale of slaves in 1838—one after a former slave (Isaac Hall) who was one of the slaves sold, and another for a Jesuit 19th-century African American educator (Anne Becraft Hall) who founded a school for black girls in Washington, D.C. The earliest buildings on campus, including these two buildings to be renamed, were built with slave labor. Offering preferential status (an advantage) in admissions to descendants is similar to what most major schools have always offered to the children and grandchildren of alumni. Compared to the dozen or more universities that are contending publicly with their respective historical ties to slaveholding, this gesture by Georgetown created a significant precedent. But did Georgetown go far enough? Karran Harper Royal, a descendant of slaves sold in 1838, said that she appreciated the decision to rename the buildings and to create a memorial. But she said the initiatives fell far short of what descendants had hoped for. She said that Georgetown should have offered scholarships to descendants and included them on the committee that developed the recommendations, adding that she and others “felt the sting” of not being formally invited to Mr. DeGioia’s speech this afternoon. How many descendants of the slaves who spent their lives in service to Georgetown University can document their ancestry? How many must trace their lineage with bills of sale rather than birth certificates? One of the infinite tragedies of slavery is that last names changed each time slaves were sold. Family ties were deliberately severed. Will oral history count for Georgetown? How much money will Georgetown invest in outreach to and the recruitment of the descendants of its former slaves?